Makes 5L to 50L slurry. Makes 50L to 500L slurry. Minimum order 1. 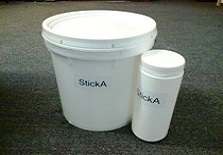 General usage tips for StickA™seed adhesive Mix using clean chemical residue free containers & fresh water (avoid chlorinated/scheme water and salty water). When using standalone slurry, that is without pelleting lime, use at a rate of no more than 2% w/w (20g per litre of water).This will reduce the likelihood of all your seed sticking together in your seed box or inoculation mixer. When using to form lime pellets (lime pelleting seed) with milled limestone, use no less than 10% w/w (100g per litre) up to a maximum of 20%w/w (200g/litre of water). The higher the %w/w usage the more durable your formed pellet will be. If you plan to handle the pelleted seed more than once or twice then a minimum 15% w/w should be used. Use warm/hot water to dissolve adhesive but ensure water has cooled to less than 30oC before adding inoculant peat culture.